Choosing A First Pet for Your Child: Meet My Daughter’s First Pet – Gem! My oldest daughter is now 5 and a half years old. She’s been wanting a pet of her own for some time now and saved up her money to get herself one. We did a lot of research on what a good first pet is for young children. There are lots of small pets to choose from – hamsters, gerbils, mice, rats or you can go with a reptile and choose a iguana, snake, turtle or other lizard. My daughter preferred a furry cuddly pet so that helped narrow it down a bit for us. But what small furry pet is a good first pet for a child and that fits your family? We had some narrowing down to do. Loo Loo is 3 now and while she understands how to be gentle we wanted to get a pet that was a bit bigger than a small hamster and something that isn’t likely to bite. Also, since my 5 year old would be helping to care for her pet we wanted it to be a pet that is easy to care for. Plus, if you’re getting a furry pet, chances are you’re going to want to pet it, hold it and snuggle it from time to time and that is definitely the case for Pinky. So, what did we decide on? We chose the same pet my sister and I had as young kids, an American Guinea Pig! 1. They are sturdy. Guinea pigs are healthy animals that when properly cared for don’t suffer from diseases. 2. They make a great pet for kids. They aren’t too fragile and aren’t as skittish as a hamster or gerbil. 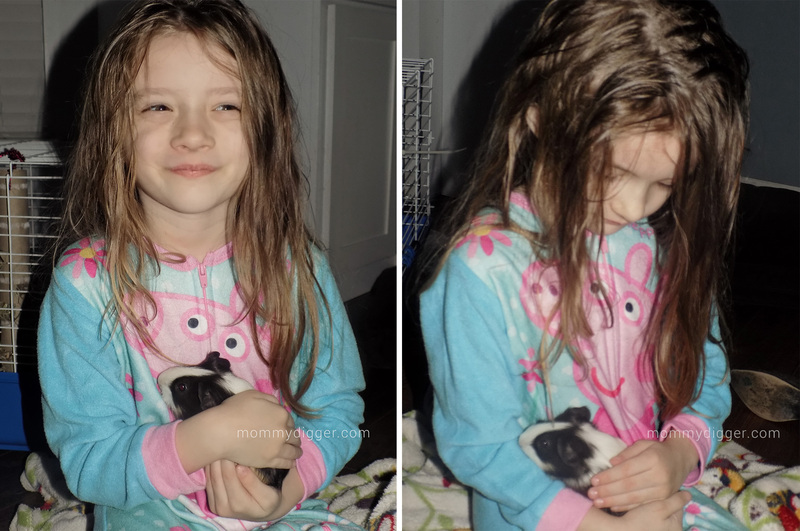 My daughter can hold her guinea pig and pet and love on her easily. 3. They are easy to care for. The cage needs to be spot cleaned daily and cleaned up completely weekly. They eat hay, pelleted guinea pig food and need a vitamin C supplement daily. They can also eat fresh veggies and some fruits. Here is a good list of foods that are safe for guinea pigs to eat. Outside of that just some love and playtime daily! 4. Guinea pigs live for a long time. A hamster, gerbil or rat will live only two to three years, on average. Guinea pigs live five to seven years and some have even lived into their teens. We loved that our little girl will have her Gem around for some time! 5. They are silly! Guinea pigs like to pop. It’s called “Popcorning” and it is a unique behavior more commonly seen in young guinea pigs when they are happy or excited: They jump up straight into the air over and over. It’s adorable! 6. Guinea pigs have great unique personalities. Some guinea pigs are shy; others are bold and dominant. Just because two guinea pigs look the same doesn’t mean they’ll act the same. Before selecting a guinea pig, be sure to interact with her to ensure that her personality meets your expectations. For example, if you’re looking for a cuddly pet, you’ll want an outgoing, friendly little pig. While we are still learning more about our Gem, so far she is loving the cuddles and has even given us some purrs. 7. Which brings me to number 6 – Yes, Guinea pigs purr! Just like cats, guinea pigs make a quiet yet audible vibrating sound when they are happy, often when they are petted gently. Most people who don’t own guinea pigs aren’t aware of this adorable sound. In addition to purring, guinea pigs make a number of other sounds including “wheeking” (squealing), “rumbling” (a sound made by a male courting a female), and teeth chattering (when they are angry or aggressive). We’re loving caring for Gem! She’s been so gentle with my girls, no biting and loves to be snuggled and has even played with us in her short time with us so far. She’s made the guinea pig squeaks and purred for us already. Pinky is over the moon with her and as she was holding her said, “Mom, I picked the right one for me.” It was precious and I’m so thrilled she’s helping to take on the responsibility of her very first pet. Has your child had their first pet? What animal was it?